Laboratory Microwave Ovens - Microwave Research Applications, laboratory microwave ovens used for chemical, medical, food and material laboratory applications. Microwave processing of materials is much more prevalent most people realize. Most people use products processed or manufactured using microwaves each and every day. Because the range of products and processes vary widely, we offer a large number of microwaves with many different options and features. All of our microwaves are built for heavy duty use as found in laboratories or light industrial use. They have high volume cooling for long life and all use mode stirrer technology to produce even heating without the use of a turntable. Turntables for laboratory or industrial use are generally not considered desirable to obtain uniform heating as turntables can be broken, intrude into the cavity and rotate the samples making it difficult to instrument the samples. There are some important practical issues to consider before purchasing a laboratory or processing microwave. It is less important to select a particular model as it is to identify the features and operating characteristics, both basic and advanced, that you will need to perform your work, testing or processing. As a manufacturer and not just a distributor, we offer standard laboratory microwaves and are more than willing to perform modifications to our standard microwaves as economical choices for your processing. If a standard or a modified standard microwave is not the best choice for your processing, we can custom design and manufactures a microwave system to specifically meet you’re processing needs. Are you sure that the samples will heat in a microwave? Unlike hot environment ovens where a material being heated will reach the temperature of the oven if given sufficient time in the oven, microwave heating depends in part on the properties of the sample material to be capable of absorbing the microwave energy and converting it to heat. Not all materials heats well in a microwave field. Most materials will in some combination absorb (and thus heat), reflect or allow microwave energy to pass through. Metals tend to reflect microwave energy. Some materials such as PTFE, Quartz, many glasses, many high purity ceramics, polypropylene, UHMW, and other materials generally do not heat well in a microwave field and allow most of the energy to pass through it. While other materials, typically that on a molecular level are said to be polar or have a net charge do heat well in a microwave field, including water, fats, silicon carbide (SiC), and carbon or similar materials. We are often asked what the maximum process temperature that our microwaves can achieve. Microwaves using electromagnetic energy heat differently than conventional ovens. Given enough time, conventional ovens will heat any material placed in them to the temperature setting of the oven. In a microwave, the heating rate and the ultimate temperature of a sample or material largely depends on the properties (generally known as the dielectric properties) of the materials being heated as well as the microwave power level. Some materials heat well in a microwave while other materials do not heat well. Properly equipped, our microwave can process materials to 1,800 °C, but. Sometimes to heat materials or samples that do not absorb (or heats) microwaves well, we add susceptor materials that absorb the microwave energy and heats. This susceptor then transfers heat to the other materials. It is the property of the material and the interaction with the microwave energy that determines the ultimate material temperature. Make sure the cavity is sized to fit your samples. Heating uniformity degrades as you overload the cavity. Generally the center of the cavity produces better heating uniformity. Do not overload the cavity, heating rate and heating uniformity may decrease. Determine how much microwave power you will need. The greater the power level of the microwave the faster the heating rate (point of reference; a 1,000 watt microwave will increase 1 liter of water 14.3 deg C per minute). Too much power will add unnecessary cost to the microwave. Will the samples be corrosive? This may require the microwave to have corrosion resistance and cavity exhaust. Will your samples exceed 150 deg C for long periods of time? If so we may need to increase the cooling of the microwave and add a microwave compatible muffle to insulate the microwave from the intense sample heat which can damage or shorten the life of the microwave. Our microwaves, when properly configured have been used to sinter ceramics at 1,800 deg C.
Power control. What level of power control do you require? 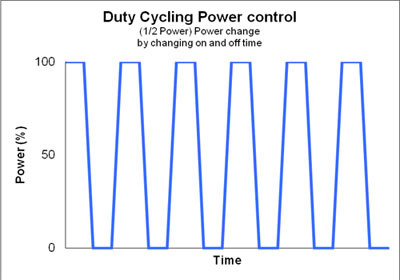 Duty cycling the power ON and OFF is a common and low cost method of adjusting the average power level. It is generally not a good method of power control for small samples or when critical process control is required for sensitive samples as the power level is always at maximum power during the ON time. The average power level is based on the amount of ON time vs. OFF time. The figure below illustrates duty cycle control of 50% power. We also offer an exclusive economical method of advanced power control called True-To-Power™ that truly adjusts the power level without the duty cycling. Our True-To-Power™ power control system allows you to adjust the microwave power level much like a dimmer switch in a dining room adjust light level. If the power level is set for 50%, it never goes above that 50% level. 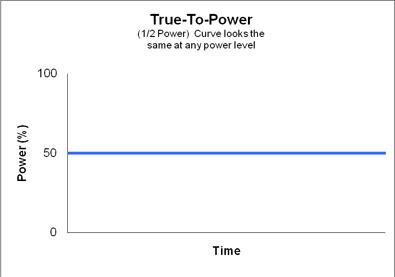 The figure below illustrates our True-To-Power™ power control for 50% power. Notice at no time does the power level increase above 50%. Process control. What type of process control is needed? Our microwaves offer a number of different levels of process control. The simplest method is to set a power level and a process time. This is a very basic method of process control found on lower cost entry level laboratory microwaves. This method is used on most histology staining microwaves and works well with other less sensitive processes such as slide drying and solution heating. We can offer this with very basic process control and keypad programming of power through duty cycling of the power. Generally you can store a number of programs, with up to 5 different power levels and up to 3 steps per program in each microwave. We offer a more advanced version of power level and time process control coupled with our True-To-Power™ power control system and onboard CPU programming; you have at least 10 steps and 250 different power levels. The CPU is programmed using a laboratory supplied PC. One method is a manual control method and includes the ability to monitor a sample temperature using a temperature probe and meter and then make manual adjustments to the power level. The process can have a programmable timer or be terminated by turning off the process manually. This method is used with our microwaves that offer True-To-Power™ power control and a temperature probe and can be an excellent way to develop the temperature profile for the third type of process control that is fully automated. A fourth type of process control that we offer is a programmable process controller where you program in the temperature profile. The process controller measures and uses the sample temperature to determine to apply or increase or remove or decrease the power to maintain the sample temperature to the programmed profile. This is a fully automated process. There are 2 different levels of process controllers including one that is a basic 3 step models and we also offer one that can be connected to a laboratory PC. It can store and call up to 31 different programs with up to 126 steps in each program. It can also download process time and temperature data to the PC for analysis or process verification. Sample mixing is a feature we have offered in our microwaves. We offer a compressed gas magnetic bar mixer for liquids. We also offer a larger sample mixer using a variable speed shaft mixer that enters from the ceiling.